If you missed Reflections on Ice: Michelle Kwan Skates to the Music of Disney's Mulan, or just want to hear what others thought of the special, this is the place!! If you want your review/comments included here, e-mail me! Also, check out pictures of the program, screen shots from the special, and hear the full song in the Michelle's Program Information section of my page. I failed to catch the whole Disney special Tuesday night because I had class from 6:00pm to 8:00pm that evening. Still I managed to watch the second half of the program. My comment? Michelle is absolutely gorgeous! As always, every move she made on the ice is perfect. It's always such an agreeable experience to enjoy her skating as she enjoys herself at the same time. And I love those eyes, full of strength and emotions. Michelle is no doubt No. 1!!! I'm going to the movie for sure, if not Disneyland! It was a joy to have Michelle share her heritage with us. She looked like she was having a wonderful time too. She is quite an actress portraying the awkward girl she once was, then the lovely young woman that she is in real life. Finally as the Tomboyish Mulan in the army. The rest of the cast was great. I especially enjoyed seeing Karen Kwan. What an elegant figure she is! Michelle's first Disney special was a SMASH. Michelle proved to the world that she has the grace, beauty and artistry of a true figure skater. She was so capitavation she took my breath away. She truly is perfect. Michelle, if you ever hear, see or read this...I think you are tops and you are the greatest! 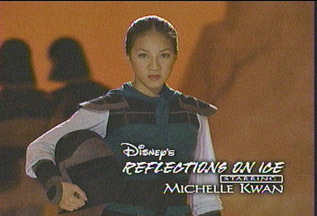 As I sat in front of the TV with my mom, Michelle and the whole Reflections on Ice Mulan special totally entranced me. I was taken into a magical world and not only was entertained, but I was informed as well. I think the story of Mulan is amazing, and when transferred onto the ice is just spectacular. Everyone should somehow find a copy of this and watch it. I will end up watching it many many many times throughout my life because it is just so magnificent. I am particularly a Tara Lipinski fan, but I LOVE Michelle Kwan almost as much. She was perfect for this part and did a wonderful job expressing the character of Mulan--her thoughts, her feelings, everything about her. It was absolutely fabulous! I think the "Mulan" speical showed us how great a skater Michelle Kwan is. I enjoyed seeing her skate with Philippe Candeloro. On the whole the show was good, but I would have liked a little more Michelle, Philippe and a little less of the animated part of the show. I just finished watching (for the second time) the ROI show. I find it very well done. The prop was superbly made, the choreograhy & customs as well. But most of all, Michelle was awesome! She shows her versatility in this show. I like the ending number with her & Philippe C. the best. Second in line is the one she did with the guys in the war field. There were some acrobatic type of acts and she seems to have fun dancing & jumping around with the guys. She actually looks so natural wearing the soldier outfit. Boy she can act! I won't be surprise if she turns to acting job. After viewing the 'Reflections On Ice' for the 5th time, all I can say is MICHELLE IS THE BEST SKATER IN THE UNIVERSE. She possesses a unique quality that no other skater has. She carries an aura that captivates ones heart. People described her as graceful, elegant, captivating, mesmerizing, exquisite, picturesque, textbook perfect, spectacular, awesome, miraculous, has powerful presence in the ice that filled the entire arena, star quality, and many many more. There is no more language that can better describe her skating talent and her personality but just simply THE BEST SKATER IN THE UNIVERSE THAT GOD EVER CREATED. As I read more about the real Mulan, it made me reflect that Michelle is the Mulan of today. As Ming Na Wen (the voice of Mulan in the movie) says, quote "Mulan would be an inspiration to any young person. She is vital & full of curiosity. But most of all she wants to be herself, to follow her heart. Her motto will be 'to go out there and do it, don't be afraid of failure, keep your eye on the goal and you will eventually get there'". Michelle Kwan certainly does! I think this was the best Disney ice special ever. I must admit my original reason for watching was just Michelle. But everything about it was great. My daughter watched it because my 9-year-old granddaughter likes figure skating and Disney. She (daughter) loved it. She said she usually doesn't like the Disney ice specials because she thinks they are boring, but she loved this. She was kicking herself for not recording it, especially after I said I was getting ready to rewind and watch it again. As I sat waiting for �Reflections on Ice� to begin, I was as nervous as I was waiting for the National, Olympic, and World competitions to begin. But once Michelle started to skate in the opening number all my nerves disappeared and I sat entranced for the entire hour. What fun it was to watch Michelle bring the character of Mulan to life. I honestly can't say which scene I liked the most, each scene seemed to bring out a new side of the character and Michelle's talents. As Mushu said, �Our little girl is all grown up,� and hasn't she grown into a lovely young lady. Kudos to Michelle on her wonderful performance in her first TV special! "Reflections on Ice" definitely tops my list of favorite Disney skating specials. Philippe Candeloro and Michael Weiss also gave outstanding performances. I think Michael should be nominated for an Emmy for the expression on his face during the last few seconds of his �death scene.� It was fun seeing the softer side of the flamboyant Candeloro in the closing scene with Michelle. I've always been a Candeloro fan but am an even bigger fan after watching his performance in this special. Kudos to Sarah Kawahara on the choreography. She did a great job of handling a lot of bodies on a small ice surface. I really enjoyed all the army group scenes. Of course its a given that I loved her choreography for Michelle, Philippe, and Michael. Kudos to the skaters simply referred to as the �Disney Mulan Skaters.� Not only was their skating top notch, but they really carried through with great facial expression and body language. The comments that there was not enough skating in the special surprised me. I was pleased at how much Michelle, Philippe, and Michael did skate. Considering that all 3 were on tour, 2 of them competed at Worlds, and 1 was nursing an injury, I don't know how and when they found time to learn all the choreography and develop the characters. I agree with the comments that the Punsalan and Swallow performance didn't exactly fit into the scheme of things, but I assumed Disney was trying to please skating fans by giving us more skating rather than more animated cartoon clips. Whatever the reason, I enjoyed their performance. In fact, I thought the entire "celebration of the fiery dragon" scene was very entertaining. The skaters with the fireworks were fantastic, the colorful dragon winding its way across the ice was fun, and Michelle looked like she was having a blast dancing around at the end of the scene. Kudos to Jef Billings on the costume design. He certainly met the challenge of making the costumes blend in with the movie clips. I loved every minute of the special, but there is one moment that will live in my heart forever. Michelle has always been very close to her sister, Karen. I was delighted when I heard Karen was going to be in the special and was looking forward to seeing her as part of the cast. But when Michelle and Karen linked arms and stepped through the arch in the matchmaker scene and were standing side by side on center stage, tears started streaming down my face. I can't imagine how Danny and Estella Kwan felt when they watched that scene . . . I liked what I saw, but the Reflections routine I saw on tour, and the one in the special were *very* different. I liked the tour one better. Looked like there was too small an ice surface (and too crowded a one) to the routine I saw on tour. I kept thinking that Philippe and Michael should have played each others part...but Michael seemed to be having the time of his life hamming it up as the evil guy. Plus he got to play with a falcon. Disney kept doing that annoying thing where they cut into the routine with bits from the movie...although, if I were a kid, I suppose my view would be that they kept cutting into the movie with those annoying skating bits...;-) Perspective is everything. Karen Kwan was in it! She was a background skater who kept popping in every once in a while. She was one of the women escorting Mulan to the matchmaker. She's about a foot taller than Michelle! LOL I know it's not really that much, but boy, side by side, does she look it! There was a part where Michelle and two of the other 'soldiers' do a jump simultaneously that was bang-on. Really wonderful and gave me goosebumps. Did anyone else notice how *good* Michelle Kwan and Michael Weiss looked skating together (for the whole 15-30 seconds they skate together)? LOL they'd make a pretty impressive pairs team! IMO they had good spark and complemented each other well. They both have impressive jumps, just *think* how great it would be if they DID go as a pair! LOL I know, I wouldn't deprive either singles division these two stars, but I can dream...and wow, what a dream. "Reflections on Ice" was beautiful! Michelle Kwan was the perfect Mulan! The music sounded so much better after I saw the special, Michelle Kwan, all the great ice skaters and the movie clips really brought the music to life! I loved the costumes and scenery designs, but most of all I especially love the skating and the music! Michelle Kwan makes skating look so beautifully effortless and awesome! "Reflections on Ice" was totally fun to watch!" I loved Michelle's special and I know what you mean the hour went by too fast. I thought the choreography and all the costumes were just unbelievable! Michelle skated great and you could see how into the story she was! Watching a second time I see lots more detail then before and I am totally blown away! Michelle was so awesome! Do you have any favorite part of the special? One thing I thought was really cool was how when they introduced Michelle they showed her then "transformed" her into the drawing of Mulan! That really tied the special in with the movie for me! Enjoyed Michelle's special very much. She was awsome as usual, and her talents are endless. Disney thank you for seeing the talent and giving us, the fans, the joy of watching the best. MICHELLE, MICHELLE - She is certainly the best skater in the history of skating. I enjoyed the Mulan Special and was so glad I tapped it. I must have watched it 10 times. The music, costumes, stage were all done in such taste. But Michelle certainly put it all together. She was able to create this character and for that one hour was able to bring the character to life and tell the story. Michelle's skating numbers were extraordinary, and she performed them brilliantly. She is the master of technique, grace, power, extension and line, and this Mulan special certainly brought that out. I would also like to thank Disney for allowing us (the fans) to enjoy this special and will look forward to her other specials. After I saw her perform the number with P. Candeloro I said to myself. There is nothing she cannot do, and do well. The skating special was very beautiful,even though some parts were sort of corny. We recorded it so we can watch over and over again.Michelle skated beautifully. It was fabulous! Michelle looked great in it. I loved the music and costumes. Michelle is Mulan. She completely captivated me (and my friends who were watching with me). I was so impressed with how seriously she seemed to embrace the story. Mulan is beautiful, courageous, and full of honor. Those are adjectives you could use to describe Michelle too. Kudos for whoever it was at Disney that thought of Michelle in this role. I can't wait to see the movie. I agreed with many of comments posted. I thought Michelle was awesome. The program showed how versatile she could be. And she looks great as a soldier too!! I have seen the tape again and again. (I did the same with Dante's prayer.) I still could not believe she is only 17 with such grace and honor!! If she could perfect her jumps, someone has to be ridiculously good to beat her in the 2002 Olympic. By the way, I found it ridiculous that Disney used JAPANESE swords in the program!!! CHINESE swords are straight, not curved!! The last segment of pair skating was GREAT! Why don't we see it in the COI tour? Her precise timing in landing with the other two soldiers gave me creeps too. And she looks much more in "sync" with Michael than with Phillip. I loved Michelle's first TV special. The more I watched, I more mesmerized I became. So many routines were so original and clever, such as one skater skating with fireworks on his feet! And, of course, Michelle was just beautiful and skated so well. She was perfect for the role. I'm the network and Disney are proud of her. I won't be surprised if the set designers, costumer designers, choreographer (Sarah Kawahara), and Michelle all get special Emmys. Michelle Kwan is my favorite skater, but the surprise scene-stealers of the Reflections on Ice special had to be Punsalon & Swallow.Their performance to "Be True to Your Heart" was fabulous! I loved the Michelle Kwan skating special. I think it was a tremendously artistic and entertaining show. I really enjoyed watching the special of Michelle Kwan's Mulan on ice. She was spectacular and graceful to watch. I was always amazed at all her skating specials. I thought the character Mulan really reflected her because of her dedication to be a fighter. She was the perfect skater to play the part of Mulan because only a true skater can skate and play the role of such a courageous Disney character. Also, check out a great Mulan FAQ page. I learned so much about the legend of Mulan, and the movie from this site!